Spring is the perfect time to prepare your vermicomposting worms for the upcoming warmer weather. You need to make sure the worms are breaking down accumulated scraps. When do you need to add fresh adult worms to speed things along? When should you harvest the worm castings, and how? How do you use organic compost? Do you need a different compost bin? Should you add bedding, and how? Find out the answers to these questions and more below. Once it gets warmer with no chance of frost, check out your composting bin. It’s the best way to plan for the revival of your mostly dormant composting worms. You need to take stock of your worm inventory. For those who live in a cold climate, your worms likely died in the frost and bite of the past winter. Some worms may have wiggled to warmer depths of the bin and survived. Chances are good that the worms laid eggs before perishing. Do you have any baby worms? Baby worms will appear as small brown flecks at first and grow into little worms. Have all your adult worms died off? You might get lucky and see some adult worms. If you see only a few worms, or not many newly hatched babies, you can replenish your worm population at Uncle Jim’s Worm Farm. We recommend the Red Worm Mix for composting. European Night Crawlers, also known as Super Reds, are larger worms that can be used for composting or released into the garden or lawn. They are also excellent for fishing. What Should be Done with the Harvested Humus? The soft, powdery, black material in the composting bin is humus. Humus is worm excrement. It is filled with all the good stuff to make gardens grow — nutrients, bacteria, and fungi. 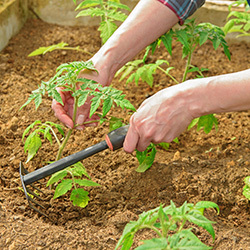 Spring is the best time to take advantage of your home-made fertilizer. 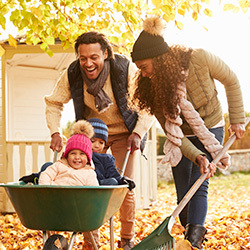 Wherever you have gardens — indoors, outdoors, in pots around the house, even the lawn — your natural organic fertilizer will give your plants a growth boost. Harvest some of the humus from the bin. Apply it directly and generously to your gardens as well as your lawn. 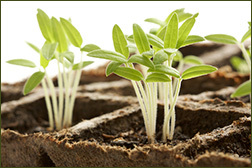 Some gardeners mix the fertilizer into the soil half a foot to a foot around plants. You don’t need to worry about overdoing the amount. This is a non-toxic, organic fertilizer with no chemicals. You can never have too much compost! 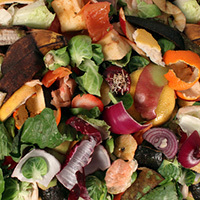 See our post about applying compost for more details. Just note that sometimes you will find undigested kitchen scraps. Don’t be alarmed! Now that it’s getting warmer, your worms will be more active. In winter, they were sluggish, in hibernation, or dying off. In no time they will start eating away. We suggest you hold off a few weeks until the scraps are eaten as harvesting will be much easier. Should you have more fertilizer than you can use at the time, we recommend storing the unused portion in a bucket or sack. Stored humus is still good as it contains ample nutrients for plants. But it’s never as good as fresh fertilizer. Try to use your stored humus promptly before the organisms inside die off. Spring is also the right time to determine whether the composting bin suits your needs. Is it the right size to produce the amount of fertilizer that you need? Do you need to make any repairs or upgrades? On Uncle Jim’s Worm Farm website, you can choose from a large selection of composting bins and products to improve your vermicomposting experience. Many vermicomposting enthusiasts find that their bins are almost depleted after harvesting the fertilizer. How can you gauge whether or not additional bedding is needed? When you see too many worms in a small amount of bedding. If things look too crowded, you need to add bedding. You can make bedding from several types of materials. Coconut coir, composted leaves, pure peat moss, and shredded black ink newspaper make great bedding. See our post about bedding. Moisten it with tap water that sat overnight. Stir the mixture. It should have the consistency of a wrung-out sponge. Add it gradually to the worm bin and stir gently to avoid suffocating the worms. Take a look at our other blog posts for more details on Spring vermicomposting and composting techniques. Uncle Jim’s Worm Farm is the #1 supplier of composting worms and supplies. All our worms are born and bred in the USA at our farm in rural Pennsylvania.